"Great staff. They make me feel like family instead of a number." - James C.
Learn a little about the staff that will be working with you! We offer extended hours for your convenience. We offer a wide variety of services to meet the needs of our community. Our office was designed with you in mind - comfortable, with the latest technology. We are your neighbors, friends, and we value our patients! We are committed to providing outstanding dentistry and friendly patient care in a comfortable atmosphere. We like to stay on top of the latest technology so that we can provide you with the best that modern dentistry has to offer. We even have some of the little comforts - like massage chairs! Our patients leave our office knowing that we care. 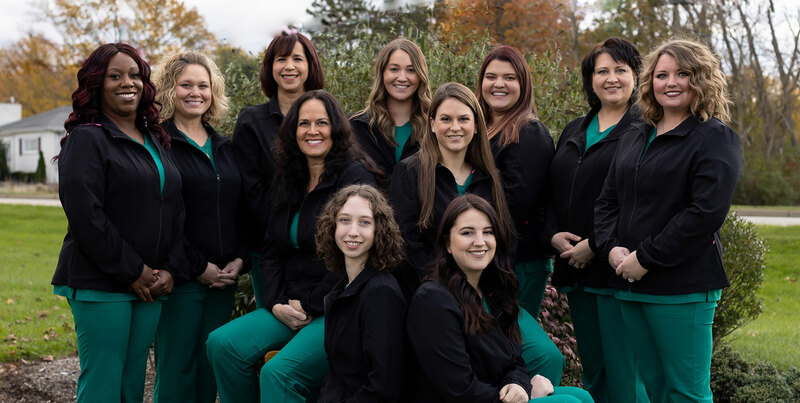 Dr. Deanna Thomas, Dr. Noelle Peters, and our entire team are pleased to provide exceptional dentistry to our friends and neighbors in Hermitage, Sharon, Sharpsville, Mercer, Clark, Farrell, West Middlesex, and all surrounding areas. Please take some time to look through our website to learn about our staff and all the services we here at Thomas Family Dentistry have to offer. We know that dental visits are stressful for many people. That is why our team works hard every day to help you feel comfortable in our warm, inviting office. Treating you like part of our family makes visits enjoyable for all of us and shows you how very much we value you as a patient. Getting to know you is also important because it allows us to provide individualized care that fits your unique needs. We also want you to enjoy your time with us. Our team is friendly, fun, kind and professional. We love getting to know our patients because we can give you the best care when we learn about you! Let our well trained staff assess your needs and provide you with the best possible dental care. We’re open five days a week for your convenience in scheduling routine appointments. We know you and your family are busy, so we’re also here until 7 PM on Tuesdays so you can schedule appointments for your family after school or work hours. Interested in family appointments? We can make arrangements to see several members of your family at one time for dental cleanings to reduce the number of trips you need to make to our office. Are you experiencing pain? Dental emergencies are stressful and often painful, and unfortunately, they can happen to anyone. If you have a dental emergency, we encourage you to call at the first sign of symptoms. Dental emergencies rarely resolve on their own and often worsen. Don’t wait! Our team wants you to get the relief you need as quickly as possible. When patients leave our office, we always want them to feel that we care - not only with their dentistry, but also by the way they are treated. We personalize our service in order to treat you the way you like to be treated and consistently invest in you by updating our technology, skills, and education. Providing the best is not something we want to compromise! We want every experience to be a positive one. If there is ever any way that we can make you feel more comfortable or cared for, just let us know! We make it easy to get the dental care you need to stay healthy by working with many insurance plans, offering financing options, and by providing excellent value for our patients. To learn more about any of these convenient payment options, please visit our Financial Page or contact our Hermitage dental office at (724) 347-2722. Dr. Thomas, Dr. Peters, and our entire team would love the opportunity to meet you and welcome you to our dental family! Please give us a call and we’ll be happy to schedule your next dental appointment.